Fishing provides us with many benefits; a way to connect with nature and each other, a way to gather our own food and a way to erase the stresses from a busy work week. 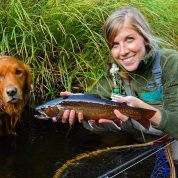 Here, passionate fly angler and fly tyer Malorie Crispo tells the Monocular just why she fishes and why everyone should give angling a go at some point in their life. “My evenings and weekends are spent outdoors. From April until the end of October you can find me fly fishing in a river somewhere. I also tie flies in an effort to replenish my spent fly boxes in preparation for another upcoming season. I honestly had never touched a fly rod up until about 4 years ago. I had gone spin fishing with my father as a child but, it didn’t grab my interest. It wasn’t until I was introduced to the art of fly tying (mainly Atlantic Salmon flies) that I took interest in the sport of fly fishing. I was drawn in by the beauty and endless creative opportunity that came with tying flies. It soon snowballed into a newfound appreciation for nature. I was always a nature lover but fly fishing has somehow taught me to be more patient, to slow it down, and that the small things actually hold the most value. Fishing is important for everyone as a whole because I don’t think people realize the importance of our rivers and our waters. Fly fishing while standing in a river or a lake can really open a person’s eyes. I know it did for me. Fly fishing has been most beneficial to me as a stress reliever. Nothing makes a work day or work week melt away like an evening or a solid weekend spent on the water. You can make it as carefree or as serious as you want it to be. Sometimes I just want to go fishing to have a laugh with some good friends and drink a couple of beer and that’s all it has to be. However, there are other times when I plan serious missions and go into things with my game face on and the determination to cover major ground and fish hard.